Forget Walking in a trout-filled stream. Walk in a trout-filled bay sometime! I pulled in to the cul-de-sac near the end of Galveston Island, Saturday morning just before sunrise. This location was my second choice based on the first location having about ta dozen pickups lining the end of another cul-de-sac even closer to the San Luis Pass. I couldn’t believe my eyes … ten more pickups in this cul-de-sac, and one fisherman at my end of the parade just about to slap his new Chevy’s tailgate closed. I quickly stopped, shut down my engine and hopped out to catch him. “Hey! Can I ask you a question?” “Sure!” was his friendly reply. “Do the residents care if we park here?” “I’ve been parking here for years and nobody’s ever said nothing.” That matched what I’d heard – residents aren’t too happy about the invasion, but it has been pretty harmless so far. Wait until the lawyers get involved was my deep thought that I kept to myself. “So what’s the deal with all these people?” I asked. My fondest memories were from the post hurricane Ike days when this little development, as well as the other two (I was shopping for parking in), were boarded up and/or left for dead, a ghost town. There was nobody back then, but now we have an invasion of epic proportions. “I don’t know. I guess they expect to get attacked by trout!” he said. Actually, the last time I was here wasn’t that long ago, but it hardly registered because the fly fishing was pretty lame. No wonder I was alone that last time as well on the backside of the Island. As always, the questions came as quickly as the swarms of mosquitoes did. CHECK OUT THE ARCHIVES – for 100 more Texas Fly Caster stories about fly fishing in Galveston, Texas. Where the heck did all these guys come from? As I headed across the marsh toward the bay, I took a headcount: One boat, no make that two in close, and twelve waders inside of 800 yards range. IT WAS a regular convention, a combat situation in the wide-open Galveston Bay. Why? Sure there were slicks popping up all over the place, but I had yet to see a single bent rod. AND most were wearing heavy neoprene waders – the heaviest … my guess was the water temp was about 73 frigid degrees. Weekend warriors plain and simple. And there’s nothing wrong with that! I learned a lot about trout behavior from the DVD’s I recommended you check out (the Trout Support Series of DVD’S) a long, long time ago. The specks haven’t changed a bit. 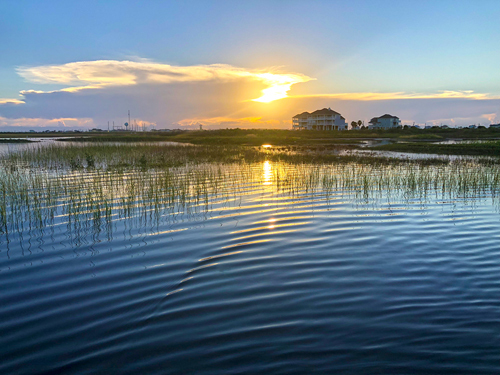 However, I walked the grass line hoping more for redfish than trout, but the area was definitely alive with bait and those telltale slicks popping up just as the sun kicked their sheen into high visibility. But I was discouraged before the first cast: I was bearing witness to the very definition of combat fishing and pressured fish. Not only had I been warned about the crowds the day before, I was also warned about a huge stingray count in the bay system … so I moved very slow and deliberately. The grass lines did not show any activity other than the frenetic mullet that so easily fool the new saltwater fly fishing wader. The area had a lot more hard sand than I remembered, and that made for some easy walking. I had to fight the urge to go fast and forget the shuffle. At least the mosquitoes are afraid of the water, I thought to myself. They had abandoned their pursuit once I was offshore – and I still have no idea why. NOTE-There’s no Monday Morning Sidewalk this Monday. ALSO – The Brazos-below-PK trip planned for tomorrow is also postponed due planning logistics.